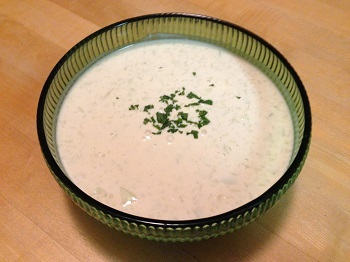 If your backyard garden has a surfeit of cucumbers, or if your local farmers market is selling beautiful cukes at a good price, consider making this refreshing, cold summer soup. I got this recipe from my dear friend Mandy Garver. It’s very easy if you have a food processor. Peel the cucumbers, quarter them and remove the seeds. Using the steel knife in a food processor, process the cucumbers and garlic by pulsing; the cucumbers should be chunky, not smooth. Add the broth, sour cream or Greek yogurt and vinegar, and salt if needed. Chill at least an hour before serving. Here’s another Tuesday Twofer, because I can’t decide which of these two yummy recipes I prefer. I clipped the second one from a local newspaper and put it in my bulging “recipes to try” folder. Then when I wanted to make it, I couldn’t find the clipping. That happened all too often, which is why I embarked on my massive get-my-recipes-organized project, which led to this blog. But that’s beside the point. Anyway, when I couldn’t find the clip, I went to the Web to search for the recipe. That usually works, but this time I couldn’t find a recipe that was the same as what I remembered. So I used another recipe that sounded good. And then, of course, the clipping resurfaced. By the way, the clip of the second recipe says it originally came from a 2000 article in Cooking Light magazine. I’ve made both these recipes and they’re both very good. You may be more likely to have the ingredients for the first one — but if you do have hoisin sauce, fresh ginger and Chinese five-spice powder on hand, give the second one a try. The only caveat I will offer is this: use real maple syrup, not the God-awful maple-flavored sugar or corn syrup. You can buy real maple syrup for a reasonable price at Costco and Trader Joe’s. The first recipe makes more marinade than you will probably need. You might want halve the recipe or set aside half the marinade in the refrigerator for later use, which is what I did. The first recipe says “broil or grill,” while the second says “broil” — but I bet you can grill it with equal success. Combine grapefruit (or orange) juice, maple syrup, balsamic vinegar and garlic in a saucepan over medium high heat. Bring to a boil and cook 5 to 6 minutes. Stir in oil. 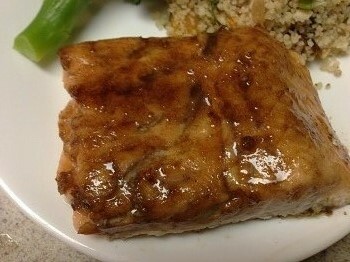 Brush salmon generously with glaze and grill or broil for 10 minutes, occasionally brushing with glaze. Combine everything except the salmon in a bowl and mix well. Place the marinade in a large zip-top plastic bag, add the salmon, seal the bag and marinate in the refrigerator for 15 minutes. Remove the salmon, reserving the marinade. Place the salmon, skin side down, on a broiler rack coated with cooking spray. Broil for 12 minutes, basting occasionally with the reserved marinade, or until the fish flakes easily when tested with a fork. Along with today’s recipe, you get a promo for one of my favorite gadgets. Now that fresh corn is in season, I always buy a few more ears than we can eat at dinner (it’s usually just the two of us). 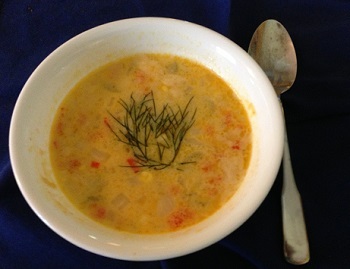 That way I have leftover corn to use for a great salad, soup or casserole. A few years ago I got tired of trying to get the corn off the ears with a knife. The knife would slip, corn kernels would go flying everywhere, and I managed to cut myself more than once. 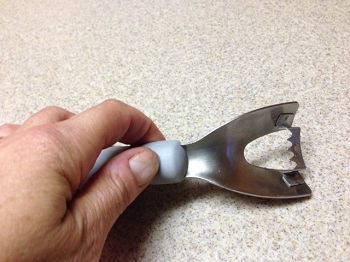 So I hied myself over to Bed, Bath and Beyond and bought this nifty “corn zipper.” It makes short work of getting the corn off the cob, though I admit the kernels still go flying everywhere — just not as much as when I used a knife. The last thing I made with leftover corner was this yummy soup. The original recipe calls for frozen corn, but use fresh if you can get it. After making it I thought it would be even better with the addition of a small, chopped potato, so I included that as an optional ingredient; cook the potato about 15 minutes before adding the corn. I also added a few squirts of Tabasco and a pinch of ground nutmeg. This soup is good — and low-fat — if it’s made with fat-free milk, but if you make it with whole-fat milk or half & half, it will taste very rich. You can make your own vegetable stock using the corn cobs after you’ve taken the kernels off as a base. Add a carrot, onion, celery, potato peels and other vegetables, peels or scraps you have on hand, cover with water, bring to a boil and simmer for a few hours, then strain out the vegetables. But I confess I used vegetable stock out of a box. Add the milk and reduce heat to a simmer. Cook for 3 to 4 minutes, stirring occasionally. Add the salt, black pepper and corn. (Remember that the smoked salmon will add some salt, so don’t use too much; you can add more later if necessary.) Bring back to a simmer and cook for about 5 minutes. Turn off the heat. Stir in the salmon. Serve immediately, sprinkled with a chopped herb such as parsley, dill or chervil. I clipped the recipe for this nice summer salad from an article by Adeena Sussman in Hadassah magazine. If you have a piece of leftover salmon from another dinner, this is a great way to use it up – and the recipe is easy to halve for two. Zaatar is Middle Eastern spice blend that includes thyme, oregano and sesame seeds. It might also include sumac, marjoram and other herbs. You can find it in any grocery store that caters to people from the Middle East or in a bulk store that specializes in spices. If all else fails, order some online! I’ve featured zaatar before, in my Roast Chicken recipe. It’s also good on pita: brush the pita with olive oil, sprinkle on zaatar, and put it under the broiler for about half a minute. Preheat oven to 400 degrees. Toss pineapple and zaatar in a bowl; roast in a single layer on a parchment paper-lined baking sheet until lightly caramelized, about 25 minutes. Remove from oven; cool 10 minutes. Gently toss roasted pineapple with salmon, pepper and scallions. 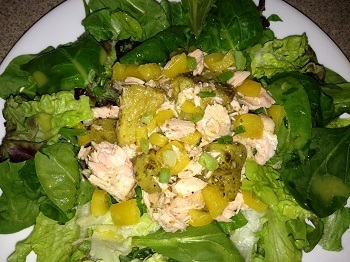 Divide lettuce among 4 plates and top each plate with a quarter of the salmon salad. Whisk lemon juice, olive oil, salt and pepper; drizzle over the salad. I like bananas to be ripe, which means yellow with brown sugar spots on them. In warm-weather months like this, bananas go from green to ripe in just a few days, and then they’ve only got another few days to go until they’re over-ripe and too mushy to enjoy. But there’s no need to fret when that happens — it’s a perfect excuse to make banana bread! 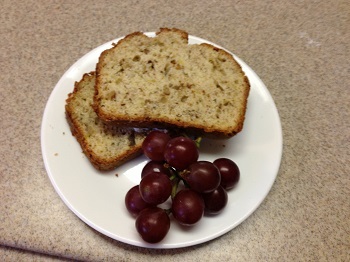 For a long time we relied on The Joy of Cooking’s Quick Banana Bread recipe. It’s a good recipe so I don’t want to denigrate it. But one day I had some sour cream that needed to be used, as well as over-ripe bananas, so I searched the Web for another recipe. This recipe is adapted from one I found on food.com. It’s very moist and rich-tasting but not too sweet, and it’s excellent with cream cheese. Cream the butter or margarine and sugar. Add the eggs and vanilla and mix well. Mix the dry ingredients and add to the egg mixture alternately with the bananas. Stir in the sour cream and the nuts and mix well. Bake for about an hour, until a toothpick inserted in the center comes out clean. Remove from the pan and cool on a wire rack. Cool completely before slicing.